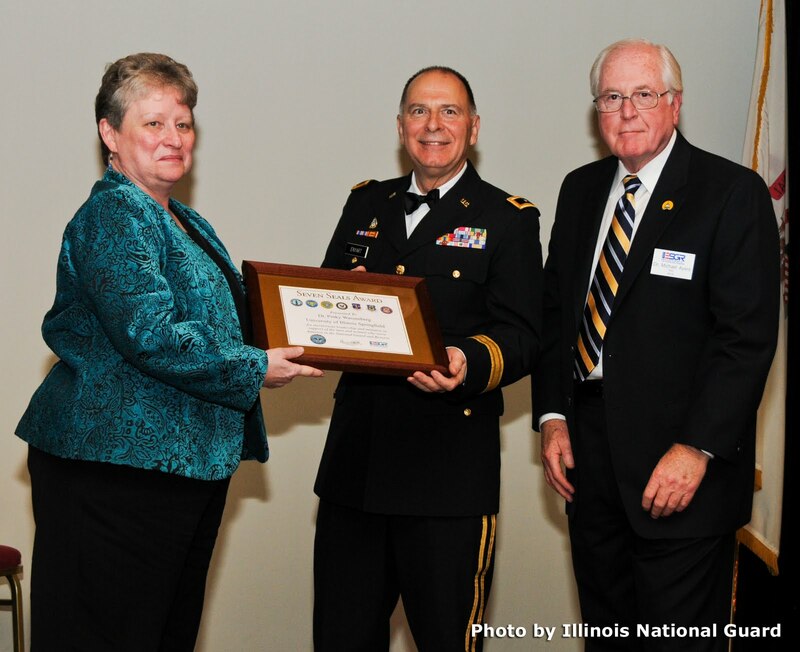 Dr. Pinky Wassenberg, dean of the College of Public Affairs and Administration at the University of Illinois Springfield was recently honored by the Illinois National Guard with the Seven Seals Award. The award honors individuals and organizations that have provided Employer Support to the Guard, specifically to units deploying to Afghanistan. In December 2010, UIS hosted soldiers from the Guard for a day of training by UIS faculty on issues they might encounter while deployed in Southwest Asia. The day was organized by Wassenberg and Joan Sestak, UIS director of Community Relations. The Guard credits Seven Seals Award Recipients for going above and beyond their occupational responsibilities to make the preparation training beneficial for all involved. 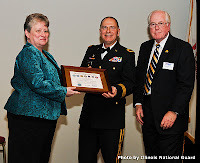 Support from employers is crucial for the long-term success of each citizen-Soldier and the National Guard and Reserve. “The individuals we honor tonight provided members of the Illinois Army National Guard an expanded knowledge of how our units of government accomplish their daily operations in the critical infrastructure sector,” said Lt. Col. Tim W. Franklin, during the December 13 awards reception at the Governor’s Mansion. During the training at UIS, faculty members helped to educate troops on Afghanistan’s history, culture, public health needs, and economic structure among other topics. The Guard approached UIS, the University of Illinois at Urbana-Champaign, the City of Springfield and Sangamon County about forming a partnership. The result was a three-day training session for about 40 soldiers called “Infrastructure 101”. UIS faculty members who participated in the training include Adriana Crocker, Kathy DeBarr, Michael Lane, Shahram Heshmat, Don O’Neal and Ali Nizamuddin. For more information, contact Derek Schnapp, director of UIS Public Relations at 217/206-6716 or email dschn3@uis.edu. A group of student-athletes from the University of Illinois Springfield spent their Saturday volunteering at Sangamon County Toys for Tots. The volunteers helped sort donated toys at the group’s Springfield warehouse. Students from a variety of UIS athletic teams worked in shifts throughout the day to organize hundreds of toys by age and gender. The toys will later be delivered to agencies in Springfield, just in time for the holidays. “I think it shows the Springfield community that we care about them and I think as a result we get a lot more people at our games that support us because they know that we’re engaged members of the community,” said Tina Buck, a junior softball player. Buck hopes the support they’re showing the community will benefit them on the field through increased fan support. “It shows that we do care about them and we want them to care about us when we’re out on the playing field and hopefully that will lead us to more winning seasons,” said Buck. The students also learned from the volunteer experience and for many it made them realize how fortunate they are to be playing on a team and receiving a higher education. “It makes me feel better because I know I can give back to the community and I’m helping people who are less fortunate than me,” said Ashley Stariha, a sophomore women’s soccer player. “I didn’t realize how much they actually did, like this is amazing how much stuff they have here, so it really feels good to come and give back,” said Aubrey Watson, a senior softball player. The volunteer activity was organized by the Student Athlete Advisory Committee (SAAC), which advises Athletic Department leaders, coordinates volunteer activities, and organizes fundraising efforts in the community. Dr. Michael Burlingame, the Chancellor Naomi B. Lynn Distinguished Chair in Lincoln Studies at the University of Illinois Springfield, has partnered with photographer Robert Shaw to write a unique book on Abraham Lincoln. Abraham Lincoln Traveled This Way—The America Lincoln Knew weaves Burlingame’s writing and Shaw’s images together to tell Lincoln’s life story. Burlingame uses the historical record and Lincoln’s own words as part of the photographic journey. The new book depicts the buildings where Lincoln lived and worked, the routes he took riding the circuit as a lawyer, and the places that helped shape him and his destiny. Shaw carefully composed and edited the images to eliminate any modern intrusions, so the resulting images depict as closely as possible the actual scenes Lincoln would have seen. The journey to develop the 276-page book took five years and covered more than 100,000 miles, including such locations as Lincoln’s boyhood home in Indiana, numerous Illinois sites, the White House, key battlefields of the Civil War, and Ford's Theater. Copies of the book are available in the Springfield area. For more information, visit Shaw's Facebook page at www.facebook.com/robertshawphotography.